Wherever there is luxury, glamour and work well done, PORCELANOSA Group and the Solid Surface KRION are found. In this case, we visit the German city of Darmstadt and its pedestrian centre, where we find the jewellery shop operated by the Trautmann family for three generations. It was founded in 1933 by watchmaker Wilhelm Trautmann, and then led by Peter Trautmann from 1972 until his children, the third generation, took charge. The Trautmann sisters entrusted the full renovation to the company dedicated to the planning and creation of designs in the public and private sector, Entedimension (experienced in working with our material KRION). 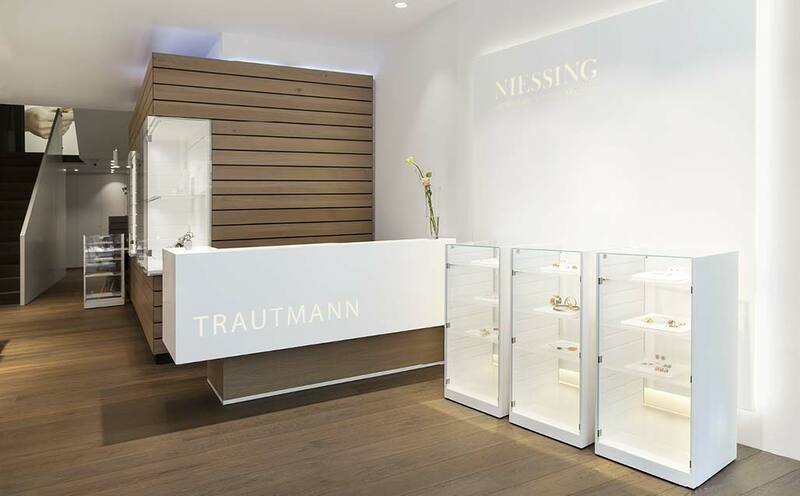 Juwelier Trautmann has used KRION to transform its counter, with a low relief backlighting, showing the name of the business when lit. We also find 1100 Snow White in the window display, integrated in the wood covering, the jewellery counters and the wood and glass tables on which KRION provides a touch of distinction on the lower floor, the upper floor being specially dedicated to engagement rings.